Orbital ATK in partnership with NASA, on Tuesday successfully completed the second of two booster qualification motor tests (QM-2) for NASA’s Space Launch System (SLS), at its facility in Promontory, Utah. Preliminary data indicate the motor performed well and provided the necessary data toward meeting our test objectives. Orbital ATK developed the two five-segment rocket boosters for NASA’s SLS, a heavy-lift rocket designed to enable exciting new deep space exploration missions. For today’s test, Orbital ATK technicians pre-chilled the QM-2 motor over the past month to 40 degrees Fahrenheit in order to test its lower temperature capabilities against the expected temperature range in which SLS may operate. The first qualification motor, QM-1, completed a successful test last spring that validated motor performance at the upper end of the propellant temperature range (90 degrees Fahrenheit). The first test flight of SLS and Orion together, called Exploration Mission-1 (EM-1), will be uncrewed and is scheduled for late 2018. During EM-1, SLS will use two of Orbital ATK’s five-segment solid rocket boosters. 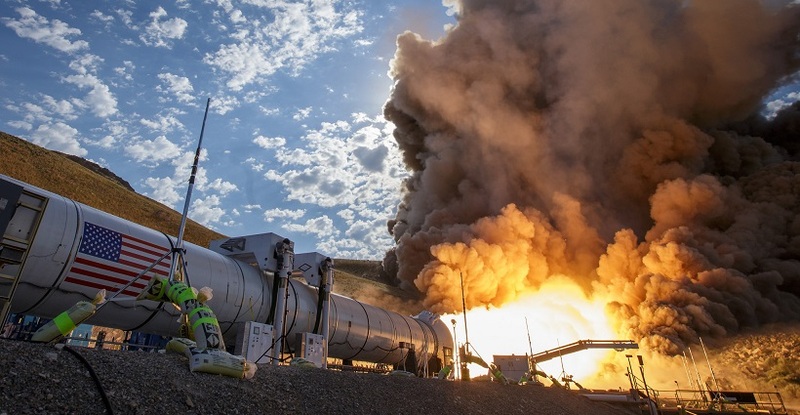 Orbital ATK has 29 key SLS booster suppliers across 16 states including Alabama, Arizona, California, Connecticut, Indiana, Kentucky, Massachusetts, Minnesota, New Jersey, New York, North Carolina, Ohio, Pennsylvania, Texas, Utah and Wisconsin.